Tarpon Springs, FL -- The Two Red Roses Foundation is pleased to announce that the Leepa-Rattner Museum of Art, on the Tarpon Springs, Florida campus of the St. Petersburg College, will host an exhibition of color woodblock prints from the Foundation's collection. 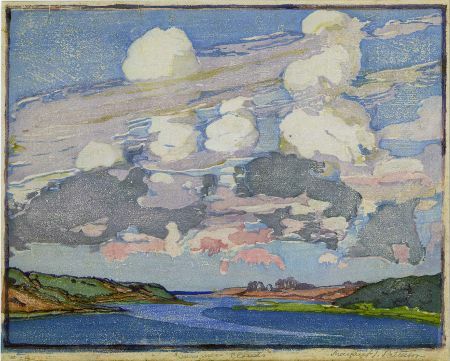 A dozen artists, including Americans Gustave Baumann, Arthur Wesley Dow, Frances Gearhart, Edna Boies Hopkins and Margaret Jordan Patterson, as well as F. Morley Fletcher of England and Austrian Secessionist Max Kurzweil, will be represented by seventy prints and two books. The exhibition will show the remarkable reawakening of a medium inspired by Japanese ukiyo-e prints due largely to the efforts of Dow beginning in the 1890s and the subsequent achievements into the 1930s on both the East and West Coasts of the United States as individual artists interpreted the medium with their own personal visions. Highlights will include a complete portfolio of Baumann's In the Hills O' Brown, Dow's personal copy of By Salt Marshes, a 1908 collaborative book of wood block prints and poetry by Everett Stanley Hubbard, and a rare example of "The Bookworm," by the pioneer of British woodblock prints, F. Morley Fletcher. This exhibition, which is the second collaboration between the Two Red Roses Foundation and the Leepa-Rattner Museum of Art, is scheduled to open November 2, 2008 and run through January 9, 2009. Guest Curator is independent scholar Susan J. Montgomery. The Two Red Roses Foundation is a non-profit educational institution dedicated to promoting the American Arts & Crafts movement, an effort to reform the design and production of furniture, ceramics, metalwork and other decorative arts in the early 1900s. Contact: Rudy Ciccarello, President, The Two Red Roses Foundation, Tarpon Springs, Florida (727) 943-9900 or email@tworedroses.com or the Leepa-Rattner Museum of Art, 600 Klosterman Road, Tarpon Springs (727) 712-5762.